This is a subject that's going to come up over and over. It's really hard for me to decide what's real and what's not. 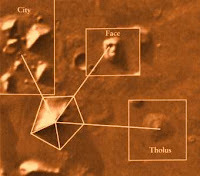 All types of pictures are popping up all over the place of alien or man-made structures on mars. Funny thing is that these pictures are coming directly from the source that's taking them. NASA is one of them. 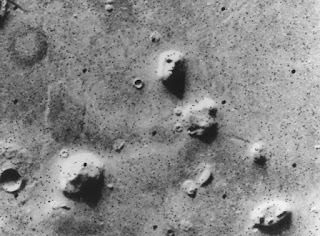 One of the biggest pictures in question, is the area of Cydonia. 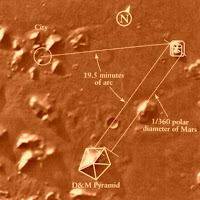 This is where the giant face and pyramids with city type structures supposedly are. You're going to have to judge this one for yourself. There is quite a bit of compelling evidence though. Let's take a look. Here someone has kindly enough done all the alignments for us and, as you can see one, way or another it's all aligned together. I suppose you could have something like this in nature, but what are the chances. Well, the chances are next to NONE! The Martian Geometry is incredible once you take a closer look. I'm not much for math, but these alignments are way too important to overlook. The theory is that these geometric alignments were made to conduct power. One very interesting fact is that the angle of 19.5 degrees keeps coming up, over and over and over again. Scientists have been all over this strange geometric occurrence. 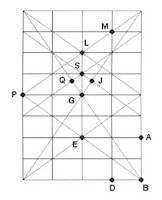 When all of the structures are taken into account and laid out onto a grid, they all amazingly correspond with the cardinal points of the planet. That's north, south, east and west. Hmmmm... It gets even better and almost a bit creepy. 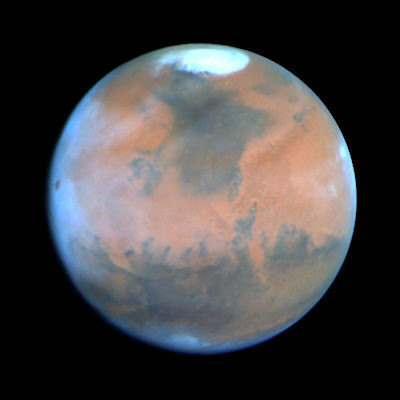 These same aliments are not just on mars, but here on earth as well. 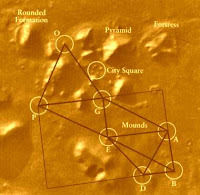 This is picture of Cydonia with a map of Avebury England on top of it. There are way to many coincidences going on here for this to be circumstantial. The alignment of the town circle, Silbury hill, the megalithic man made ceremonial mounds, "the Wall" all align with points in Cydonia, and there spot on. Avebury has also been claimed to be one of the "happiest modern villages on earth" and some say it's due the areas energy fields. This is a photo of Silbury Hill on the left and the mound called Tholus on the right. So make what you want of this, and by the way, this is just the tip of the iceberg when it come to strange images that comes from Mars. I leave you with a few photo's to entice you do your own investigating. First is a non filtered photo coming from the Mars rover Spirit, here's the web site if you don't believe me http://areo.info/mer/spirit/191. 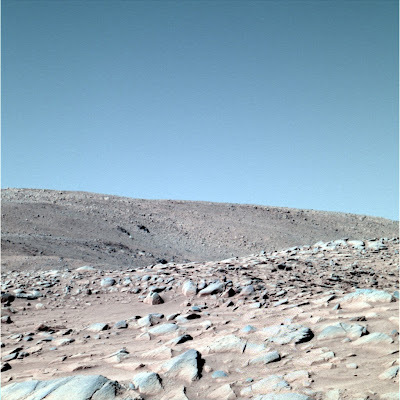 Next is the original photo of the face on Mars taken from the Viking mission back in 76' and then a photo from the Mars rover Opportunity taken this year. Yes, that looks just like a piece of wood. Decide for yourself.